Grier Martin was the keynote speaker at the Town of Garner’s Veteran’s Day Celebration, Nov. 11, 2010 at at Aversboro Road Baptist Church. Martin spoke of the need to take care of our current generation of returning veterans. Martin is an Army veteran of Afghanistan and currently serves in the Army Reserve with an airborne unit at Fort Bragg. 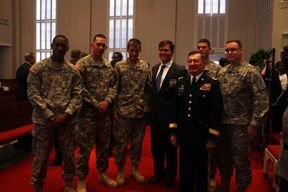 He has worked tirelessly in the General Assembly on veterans issues and was named the Legislator of the Year in 2007 by the NC Department of the Disabled American Veterans. Read more about the Celebration in the Garner News here and here.